Living indoor for a long period of time can boring! For an enjoyable life experience, we should tend to spend some of our time at outdoor where natural reflects itself in a better way! 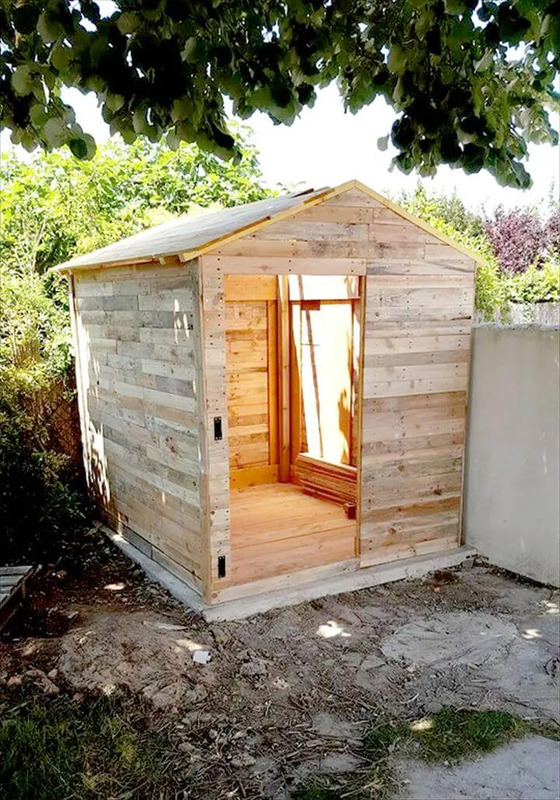 Just to make you enjoy better your natural green outdoor spaces like garden or backyard, pallet wood is having an all exciting gift which is this DIY pallet garden cabin or shed an extra brilliant pallet wood achievement for those of addicted to natural and pure outdoor climates! 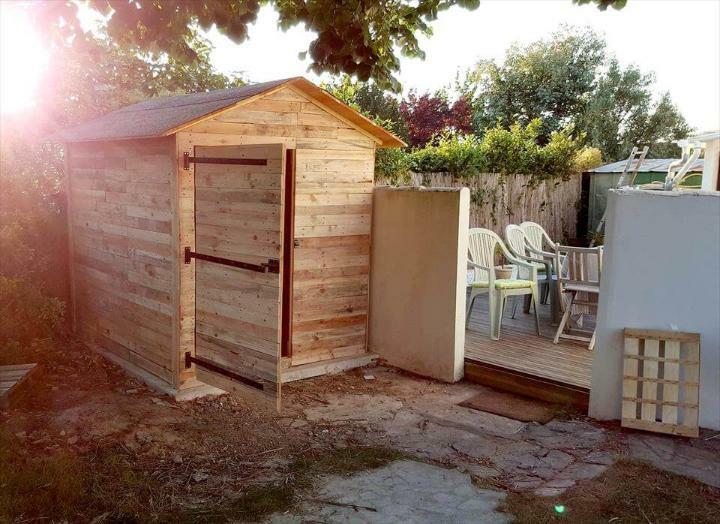 Build a custom wooden room using pallets and do raise it on a wooden floor installed to decided area for the shed! 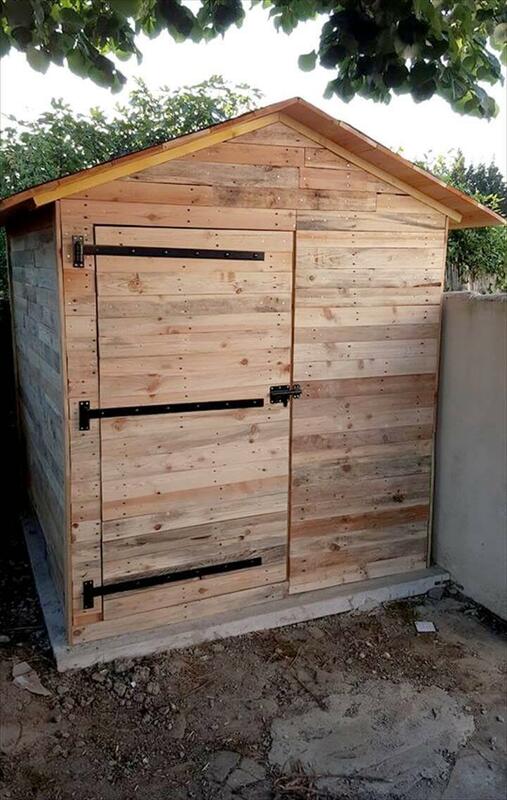 It would be all perfect to store those garden tools, potting soils and other garden material and you can also plan it to spend sometimes in arms of nature! It is having a lasting wooden front door installed using larger antique black painted hinges and also there is also a chevron roof that brings a charming bungalow style to it and has been covered with roof-felt for water proofing! 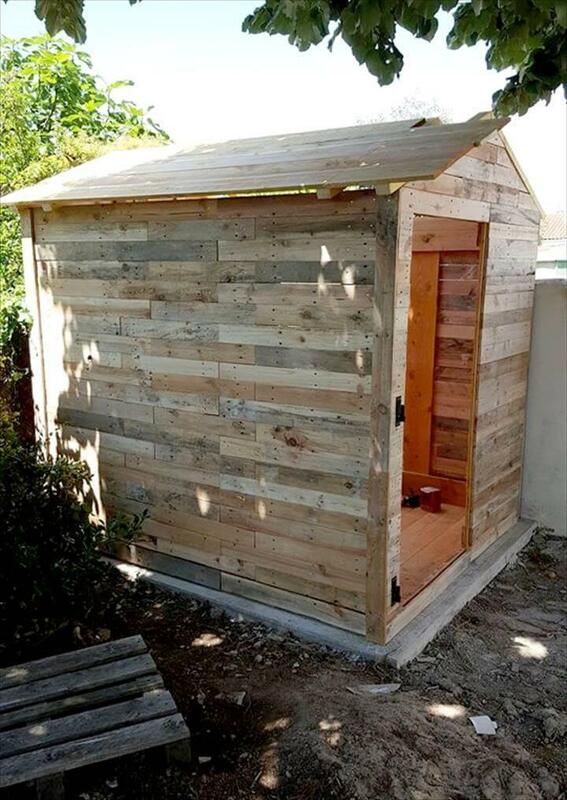 Here is a mind-blowing pallet shed that will help your to stay more at your outdoor, in garden or in backyard space! 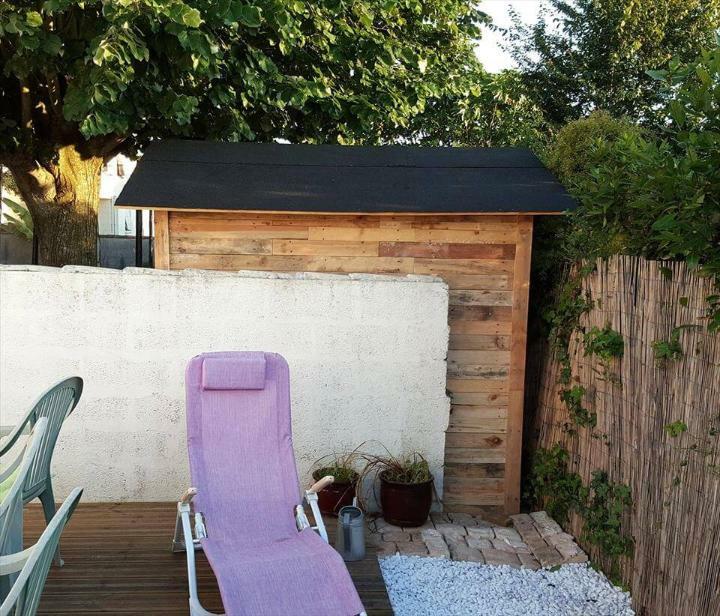 Start installing the beefy wooden walls with rough pallet boards first then go with single pallet slats to create an ever neat and filled look of walls! 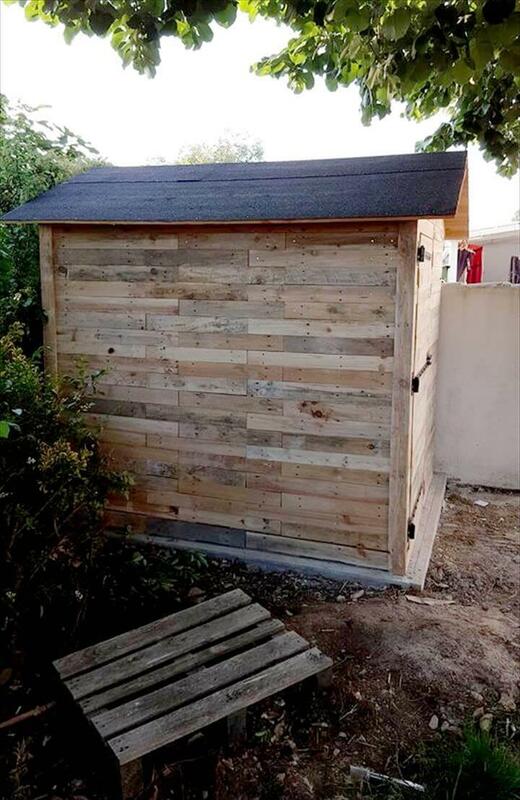 Here a better engineering has been done with pallets which gives this robust wooden cabin in revenge, it can also be utilized as perfect shed for garden tool storage! 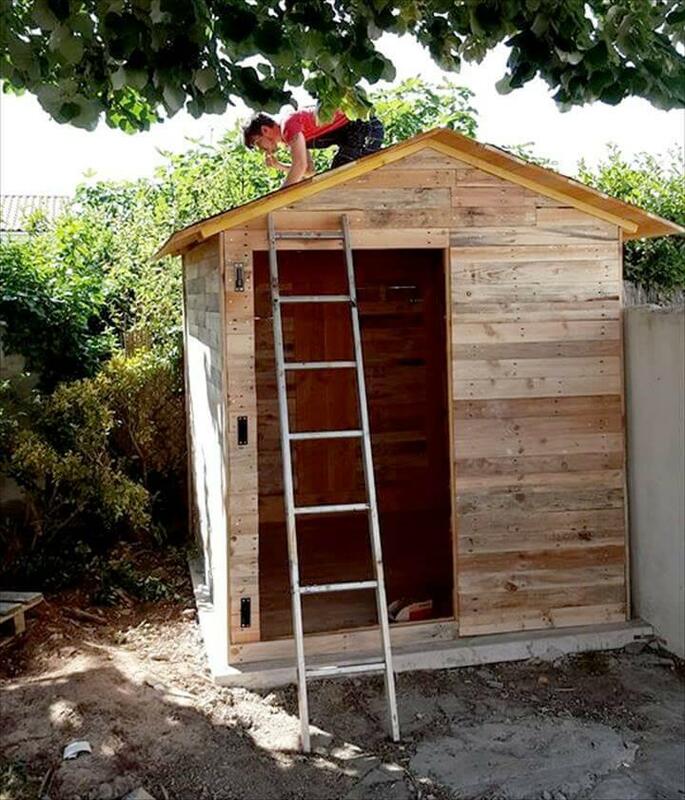 Here a black felt paper cover has been used to cover up the chevron roof of this particular wooden house and this will make the entire roof purely water-proof! You can also make the chevron roof shingled and can use accent metal roofing and those of patterned tiles for a more beautiful look of entire roof! 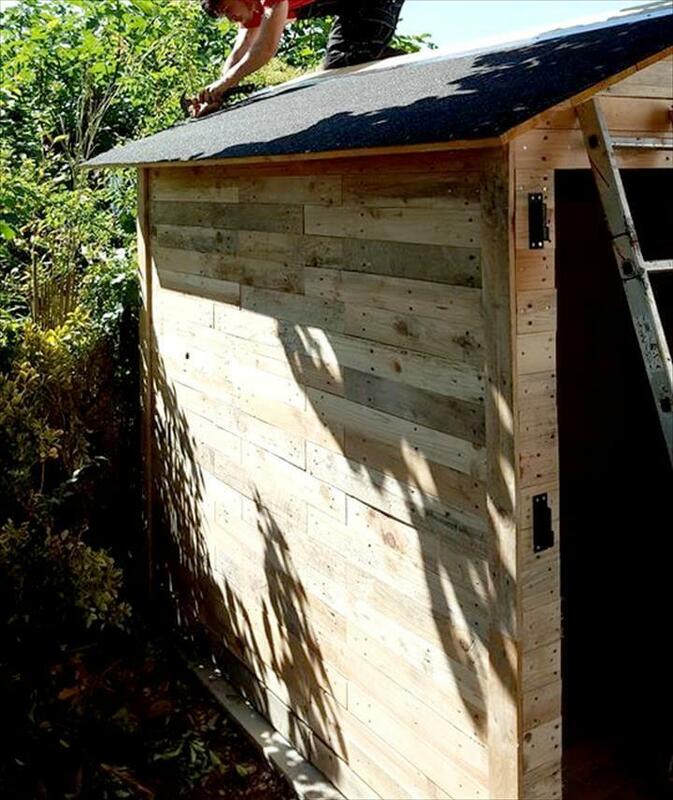 First select the area of your garden with better weather conditions and then install a wooden floor first to that targeted space, then build a big room and finish with a chevron roof! 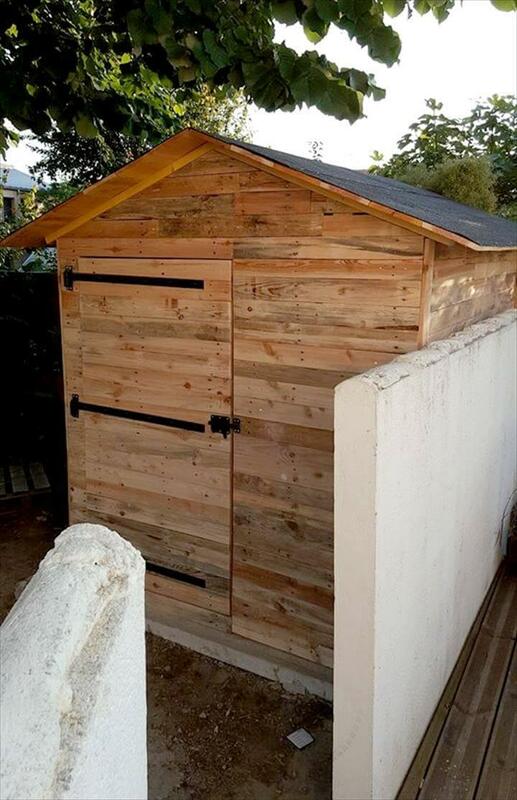 The front door has also been built from pallets slats packed neatly for a robust door output and to support the heavy weight of wooden door and spinning, the extra large metal hinges have been used and secured with screws! 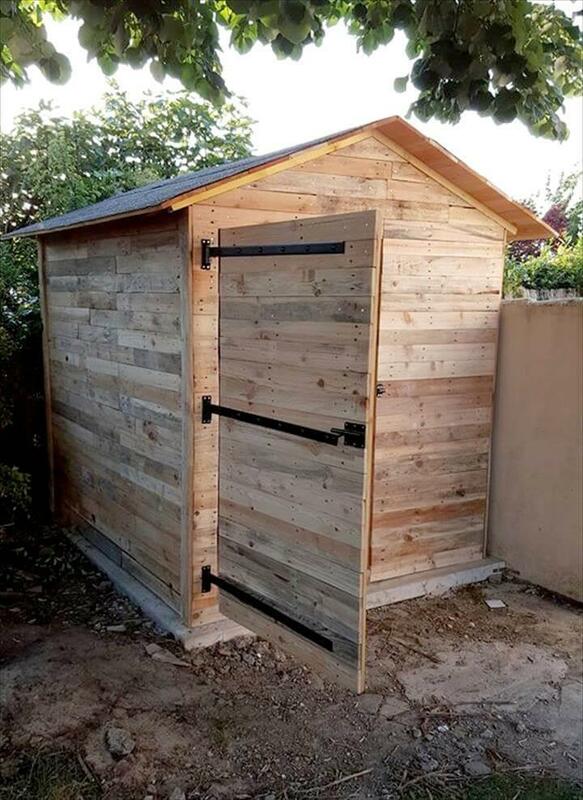 There is also a mini latch lock installed to door that provides a little security to entire wooden cabin and you can really use the better hardware lock systems in your case! After you complete the entire construction go for a complete overhauling of it and do make sure that there are no bad sectors or portions which need further repairs! Final step may be to decide a custom and personal look of it, it just looks amazing in its wooden blank avatar however, one can use paint too to give it some nice stimulating colors and hence a captivating appeal!